When you imagine a V-taper, you might think first about the waistline. After all, that’s the focal point of a perfect V, and the point where a massive upper body tucks into an impossibly small midsection. That must mean ab training is key to a V-taper, right? Nope. Hitting the core helps, but the real secret to this coveted shape is making your upper body as wide as you can by bulking up those deltoids. 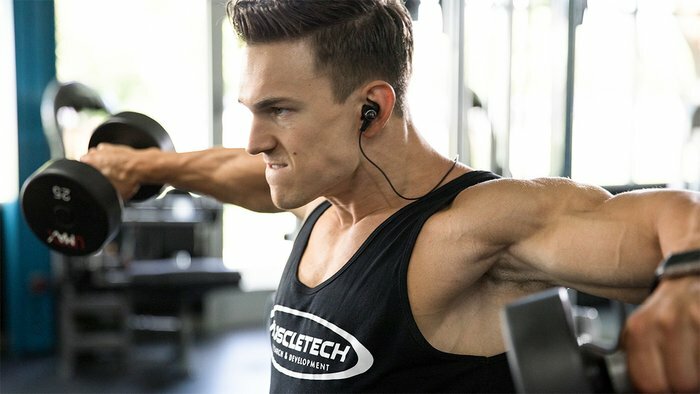 I’ve assembled five tips that will help you maximize the capper of your upper body, with the help of MuscleTech-sponsored athlete and Team Bodybuilding member Abel Albonetti. You’ll learn how to develop all three heads of this muscle, ensuring that no shoulder workout ever goes to waste. Shoulders are a relatively small muscle group compared to big movers like the back, chest, and quads. Still, you want to develop as much strength as you can, as overhead pressing also contributes to greater deltoid muscle mass. Anchor your shoulder workout with a classic pressing movement like the standing military press, seated barbell or dumbbell press, or the Arnold press. Also, consider more power-centric movements such as the push press, which helps you lift a little more weight with assistance from your back and lower-body muscles. The traditional lateral, front, and rear raises are useful exercises. Yet they also come with a significant flaw—the tension placed on the muscle can vary throughout the range of motion and dissipate altogether in the bottom position. There’s an alternative that maintains the tension throughout the phases of the lift. The secret is cables. 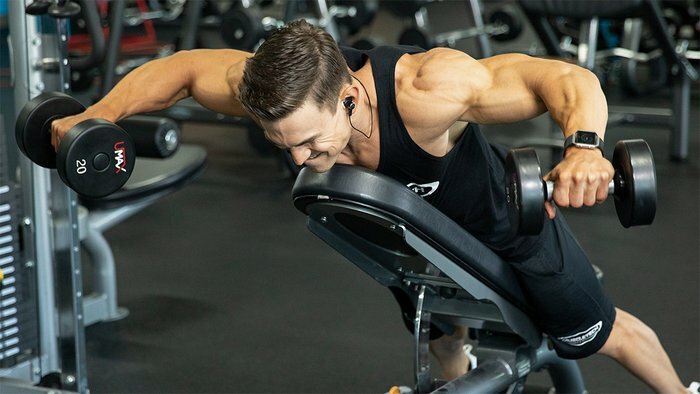 As soon as the cable is pulled and the plates lift off the weight stack, the delt head is fully engaged, flexing and straining against the resistance, throughout the full range of motion. In particular, the cable bent-over seated lateral raise and standing low pulley deltoid raise are two cable variations that diversify your workout and the way you stimulate the muscles. Of the three heads of your shoulders, the front delts tend to grow more easily than the rest because they see plenty of action on both shoulder and chest day. The middle delts are also fairly easy to hit with overhead presses, upright rows, and lateral raises. The posterior delts, on the other hand, are not nearly as active and they can be notoriously difficult to isolate. The more powerful back muscles tend to take over during rear delt raises (especially when choosing a weight that’s too heavy). To combat this, hit rear delts first among your raises, while your energy levels are high. Focus on your rear delts contracting during each rear-raise rep and keep momentum to a minimum. When you’re standing, it’s all too easy to add that unwanted bounce. Moves like the dumbbell lying rear lateral can mitigate this. This movement is even more effective with a slight grip change. Hold the dumbbells so your pinkies are up against the inside of the weight plate instead of in the middle of the handle. It’s subtle, but actively lifting the weight with your pinkies in this position helps engage the rear delts more. We preach intensity techniques a lot on Bodybuilding.com, and for good reason: efficiency. More work gets done in less time. Partial reps: Rep until failure, then continue to rep through a smaller range of motion, anywhere from one-half to one-fourth the original range. Forced reps: Have your partner help you get 2-3 additional reps with the same weight after you hit initial failure. Negatives: Have your partner help you through the positive portion of a rep and perform the negative as slowly and as under control as you can. Next articleMedical News Today: Who discovered insulin?